I was cleaning my room tonight and found a small box full of wood, all cut and milled and ready to be made into lockpicks. I thought I was missing some wood, but really I thought it was only a few pieces, not 19 cut pieces and one piece that has not been prepared. Among the wood was 4 pieces of boxwood, a thick piece of ebony, one piece of dalmatian ebony, tulipwood, snakewood, and one piece of sandal wood. 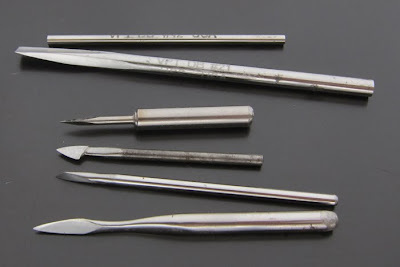 Also found a lot of small tools, carving wax, and several other non-tool things I had been wondering about. Recently I have been making some small wood carving knives. The blades are made of either drill rod or old burs. In the photo below, the top knife I made over a year ago. The blade is really good, I think it's probably my favorite, but the handle is not that nice looking. I am going to make a new handle for it later. The one below it is snakewood, I made it recently. The ferrules on both of them are sterling. The handle at the bottom with no blade is ebony with ivory at both ends. I really like that one, I just haven't decided which blade to put in it yet. 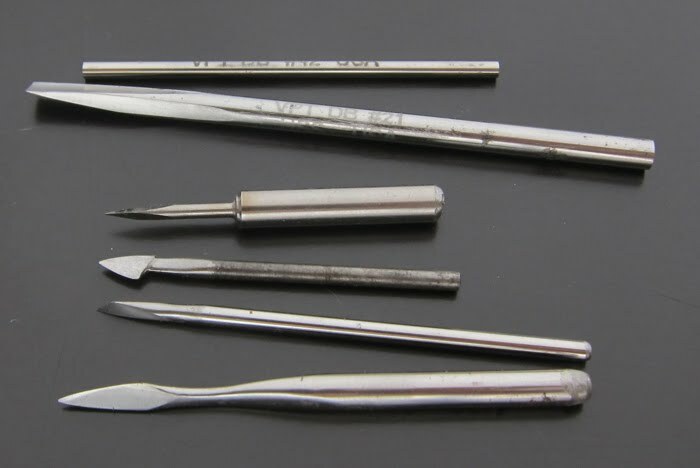 I would like to make a handle completely out of ivory, but it's a little expensive for me right now, and I might get in trouble with customs if they find me trying to bring it into Korea. I received some new wood today. 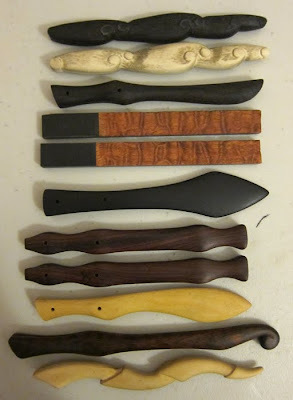 Some I got to make lockpicks, and some I got to make more tool handles. 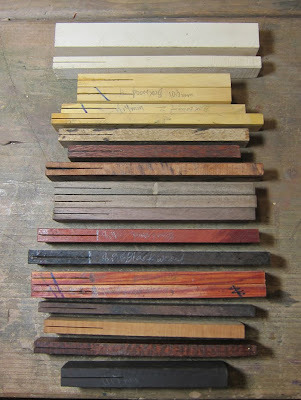 I got more ebony, snakewood, and boxwood. I am not sure what I was thinking when I ordered the boxwood in that size. I could have ordered cheaper thinner pieces, since I'm going to end up cutting most of it away. 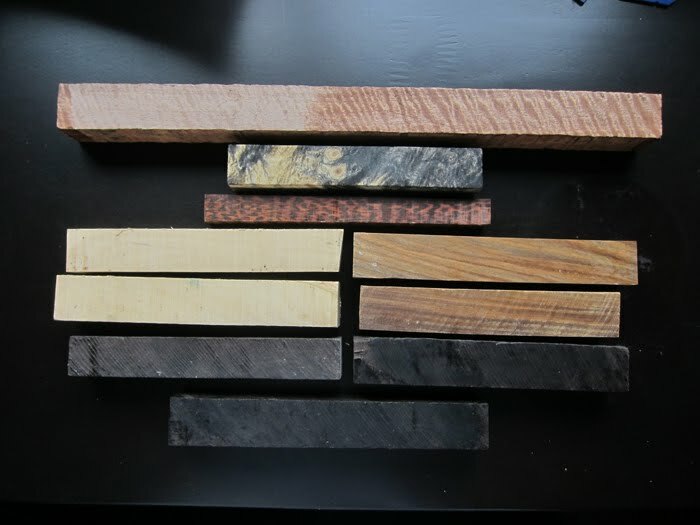 I also got some lignum vitae (two light brown pieces on the right), which I used once before in a hammer handle, and two woods I have never used before, pyinma and buckeye burl. The longest piece is the pyinma, I sanded and oiled the right half of it so I could get an idea how it will look when it's finished. The buckeye burl is the black and white piece below it. I ordered it all from Griffin Exotic Wood. I have ordered from them several times now and have always been happy with them. I ordered from another company a couple times that wasn't very good. They didn't have their wood graded. They just had "ebony", they don't say anything about the quality, if it's black, or brownish or has brown streaks in it. I don't want ebony with brown in it. If I wanted brown I would buy some other kind of wood. Griffin has most of their wood priced and sold according to a grade they give it. Since I am just buying these little pieces I usually buy the best quality. There may be other companies better than them but I don't order wood very often so I just stick with one I like. The two picks at the top I probably won't finish. They both require a lot of detailed carving, and I don't even like them that much, so I think there's better things I could spend my time on right now. In the low quality photo below are a pair of picks I am keeping for myself. I just finished the ebony one last night. It was almost finished before I went to Korea last year, but I never epoxied it together for some reason. The white pick is holly, I need to find something to seal the wood so it doesn't get dirt worked into the grain of the wood from being handled. I cannot remember if I mentioned it before, but some Chinese or Korean company is making plastic copies of this design.